Even though Canada is such an immense country, it can still be a surprise when you come across some of the rather odd, not to mention eccentric and often downright bizarre sights that this North American country springs on you. UFO’s wishing to come to Earth for a visit now have their very own landing pad, so there can be no more feeble ‘there was nowhere to park’ type excuses. St. Paul in Alberta built the landing pad which opened in 1967 alongside a UFO hotline number in case anyone say any action in the area! 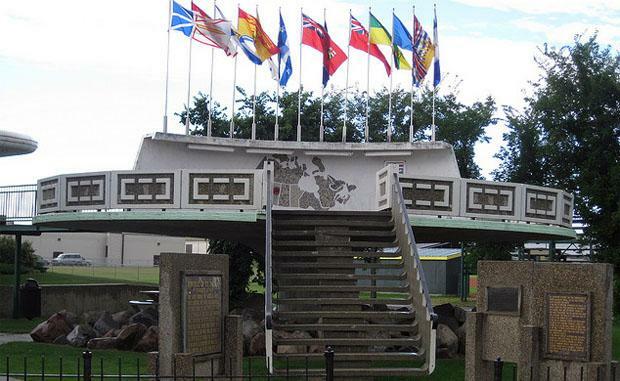 Just fewer than 2000 people live in Vulcan, Alberta, but it has many more visitors a year thanks to its label of ‘Canada’s Quirkiest Town’. In addition to a Star Trek-themed tourist information centre, attractions include “Spock’s Bar,” and the “Scrapbook Cafe,” which only serves food and beverages with Star-Trek themed names…obviously. Don’t forget to try out your Klingon. 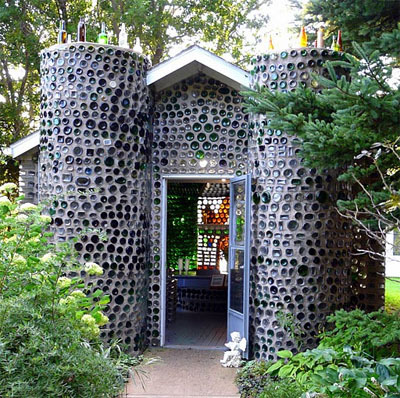 Inspired by a picture of a glass castle on a postcard sent by the inventor’s daughter, Édouard T. Arsenault collected and cleaned over 25,000 recycled bottles to build his amazing architectural attraction. There are three glass buildings and stunning glass-themed gardens that he built at the age of 66. The detail and colours, when the sun hits them, look simply beautiful. It’s one of those Canadian attractions that makes you remember why you put up with that trip to get there. Not exactly well-loved; the Gopher is considered, to put it mildly, a rather ‘pesky’ rodent to most Canadians. However, blessed with an overabundance of these cute little creatures, the folks of Alberta decided to open a museum in their honour full of the stuffed little critters in various funny and strange poses. 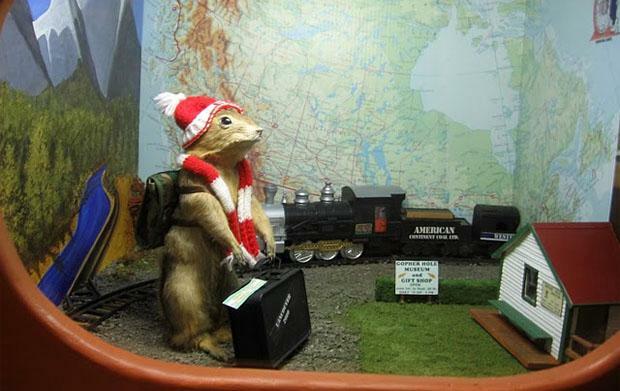 The “World Famous Gopher Hole Museum” is a delightful little oddity that attracts visitors from everywhere…don’t miss it. Meet ‘Mac the Moose’ of Moose Jaw, Saskatchewan. 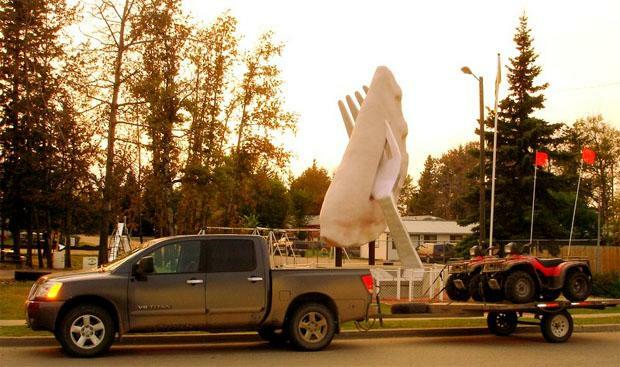 Is he the weirdest roadside attraction in Canada? Perhaps not. But he definitely draws a lot of attention! 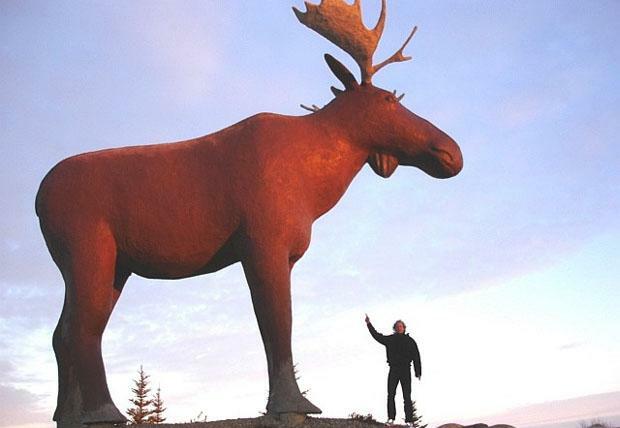 Mac stands 32 feet tall, weighs 10 tons, and greets the visitors of Moose jaw’s information centre. He also recently celebrated his 27th birthday. He was built in 1984. At 27 feet high, 12 feet wide and weighing almost 3 tonnes, the World’s Largest Pyrogy is located in Glendon, Alberta. This is definitely one of the world’s weirdest roadside attractions. It’s been in newspapers and magazines across the world. If your Polish and love your Pyrogy, head to Alberta to really work up your appetite for lunch at the Glendon Pyrogy Motel. As more and more airlines increase their routes to Canada, the number of daily flights is increase. Getting to destinations like Vulcan or the Moose Jaw’s Information Centre is now only a planetrip and some for most people. 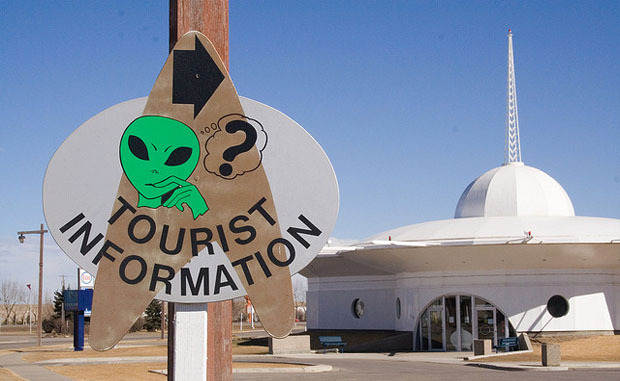 Of course if you’re coming from further afield, space for example, there is always the UFO landing pad if you don’t fancy flying into one of Canada’s airports.